For all the time I’ve been spending in the home studio messing around with music production, I really haven’t written any blog articles about the topic in a very long time. So let’s start out with one of the essential tools of the trade. One of the difficulties while mixing/mastering music is making sure you’re judging changes fairly. When you slap a new plug-in onto your mix, often times it will increase the volume which winds up tricking your brain into interpreting the result as “better” – in fact, I suppose the vast majority of audio plugins rely on this little trick to make themselves appear more valuable than they really are. For the sake of fair evaluation of changes to your mix, it’s really important to compare them at as close to equal loudness as you can manage. So that’s one reason why loudness is important to be aware of and to have control over. Ear fatigue is another reason. Of course music tends to sound “better” when you crank it up to 11, but when you’re mixing/mastering, you want to be able to sustain your listening level without fatiguing your ears so much they’re no longer hearing the important details which you’re trying to improve in subtle ways. You also want to become accustomed to a fairly standard listening loudness so you develop an intuition on how to compare how good things sound in comparison to everything you’ve heard in the past. Taking these reasons into consideration, an essential tool for music production is to have an objective sense of how loud your current listening environment is. Sure you can make it a habit of setting the volume knobs on your computer and/or music hardware to the same position every time you listen – but internal to your audio workstation the levels are going to vary pretty wildly. Enter the Sound Level Meter. I’ve got one which looks a bit like this below. Not terribly expensive and it comes in handy to make sure I’m keeping my actual listening volume consistent each time I work on a mix. You can select between fast/slow response and choose from a few weighting methods. These attempt to take into consideration the different apparent loudness caused by different frequency ranges. 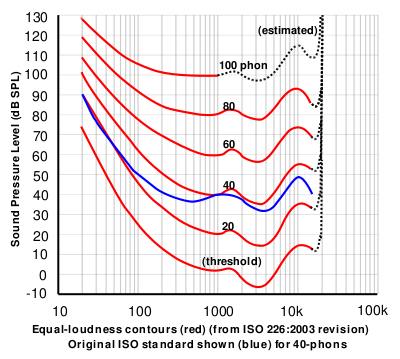 Human hearing isn’t linear in any sense of the word, and that includes how we perceive loudness across different frequencies. In fact, the so called “equal loudness counter” even changes depending on the overall loudness of the audio (yikes!). Most of the time, I try to keep my listening levels centered around 70 dB or maybe 80 dB at the most. It’s a comfortable volume where you can generally hear the small details but without causing hearing fatigue. This Sound Level Meter makes it very simple to get into the habit. After doing this for a few years, I rarely need to even check the meter anymore because that loudness now just sounds “right” to me and whenever I touch the volume control that’s where it tends to wind up.